Shortcodes are powerful feature to any WordPress theme which provides it, and they may be used for extra styling and functionality of the specific pages. AWSM themes provides several shortcodes with ability to combine them with each other inside of any page content. While you are in page/post admin, set your content editor to visual mode, and click AWSM Shortcodes button in order to open shortcodes editor screen. Columns You can use this shortcode to split you page into columns and point out some important parts of your page content. They can be used in conjunction with any other shortcodes. You can write any content or insert any shortcode between column tags. Separators These are simple horizontal line elements which you may use to divide some areas within your page content. Several styling options are provided. Buttons Basically, these are links with button style. You can target any URL here, and if you are using one-page layout there is an option that button click scrolls to some content instead of open some external URL. Main Skills You can use this shortcode to present your skills with colored bars, and set your skill value from 0 to 100. You can also use any other text here if you want. Soft Skills These are small colored boxes divided in two text sections. Use it as you like. 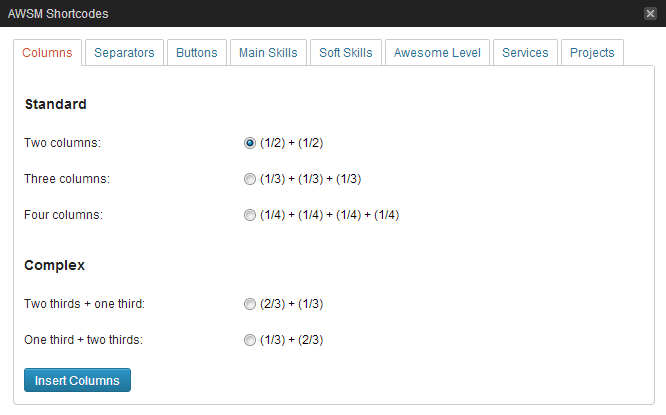 Awesome Level You can use this shortcode to display circular graph of your global skill overview. Services This are basically boxes with title, image and text. They are good to point out some important stuff, i.e. your services. Projects This shortcode is a stylish link with popup text. You can use it to display additional info for some important URL. This theme also provides ability to use shortcodes in sidebars. Use standard WordPress Text Widget and paste shortcode into the text field of the widget.